Preparing last fall for my family’s trip to Europe last month, I researched field guides, websites, and apps that might be helpful for birding in France and Germany. I planned to take my iPad and iPod, but not my laptop. 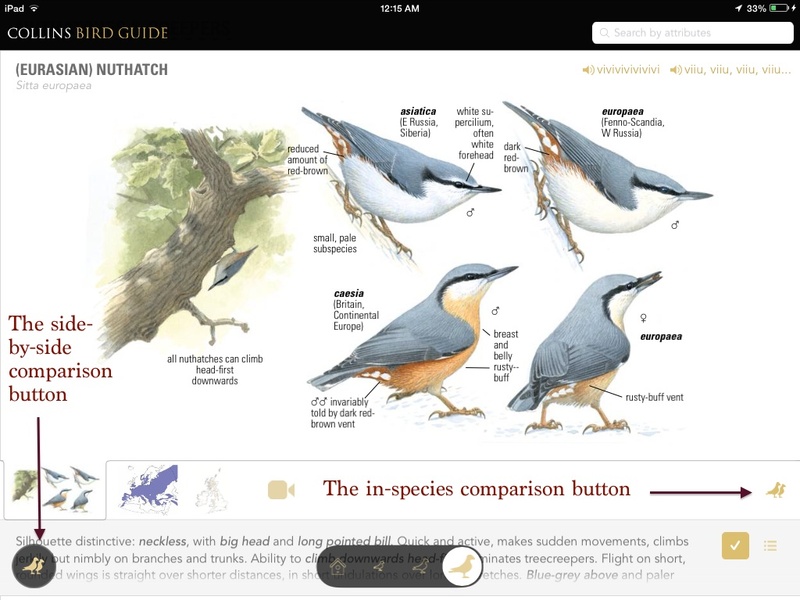 I knew I was going to take my paperback copy of Birds of Europe (second edition) published by Princeton University Press, but a few days before we left I came across The Collins Bird Guide app which I though might be useful to use with my iPad. 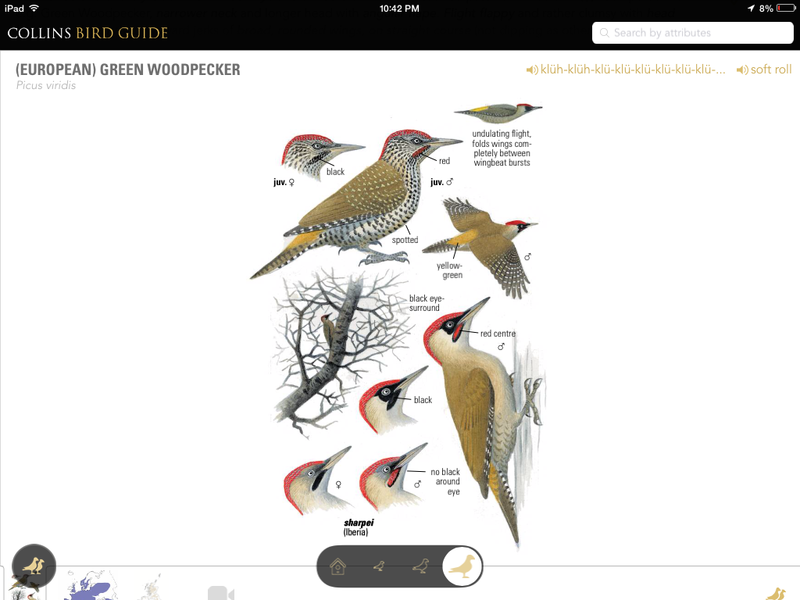 Thanks to Touchpress, publisher of the Collins Bird Guide app, I was able to get a review copy downloaded onto my iPad before our departure. I spent the flight to France learning the features of the app, and because I enjoyed it so much and found it so helpful for my trip, I thought I’d share my opinions and a little about how to use the app in this post. 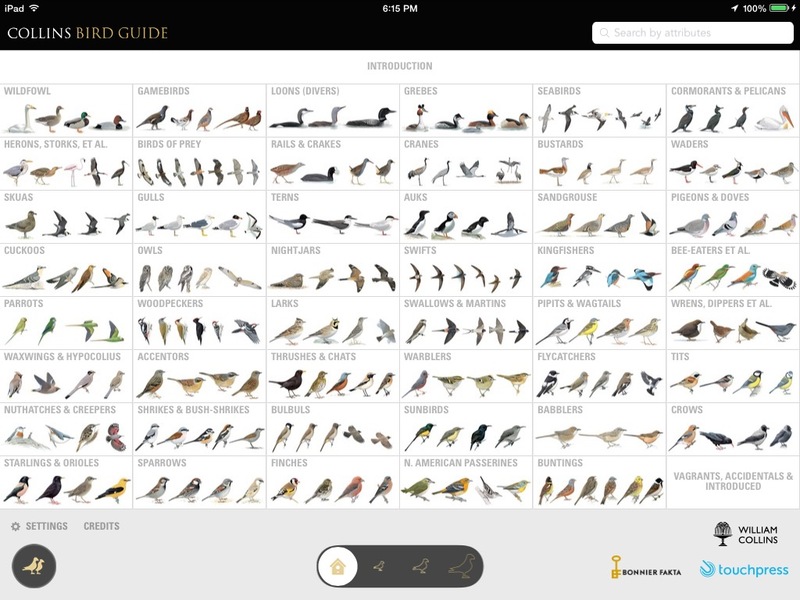 The Collins Bird Guide app is based on the book, The Collins Bird Guide by Lars Svensson, Killian Mullarney, and Dan Zetterström, which is considered the standard European field guide. 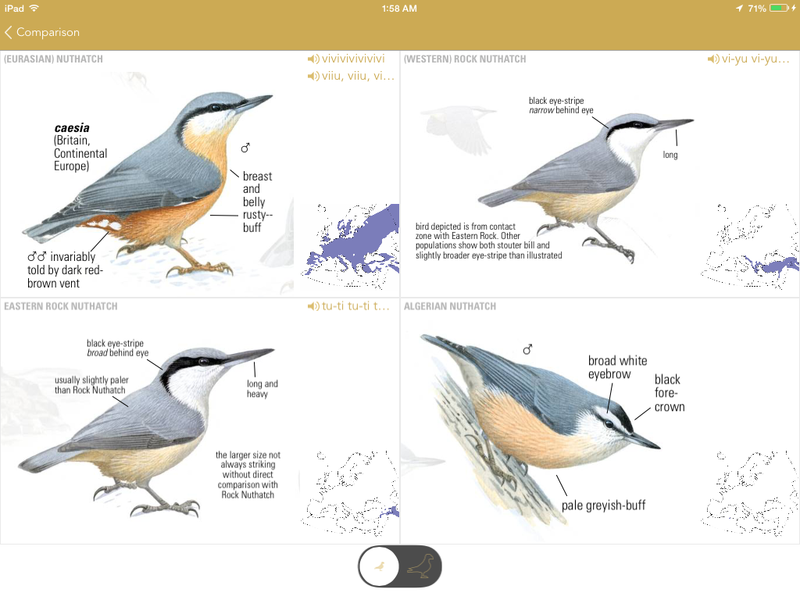 The app is very easy to navigate through its three-tier structure which includes over 700 species and more than 3,500 excellent illustrations. The first tier, which is the home page, shows a list of all the families or species groupings included in the app — you can organize the list taxonomically or alphabetically with the app’s settings. The home page also has an introduction at the top of the screen on how to use the app with references to the maps, plumages, terminology, and more. At any point, you can move between the tiers by tapping on the “house” or “bird” icons at the bottom of the screen. Both the family groupings and the species accounts are on a continuous scroll, so it’s easy to keep scrolling through the app. All but the aberrant Wryneck specialists in climbing and excavating nest holes in vertical tree trunks. Anatomical adaptations include strong feet and mobile toes (species with four toes have two directed backwards) and sharp claws, stiff tail-feathers which serve as support on vertical surfaces, also powerful awl- or chisel-shaped bill and “shock-absorbant” brain-case. Food includes wood-boring insects; have a greatly elongated tongue base for scouring and emptying deep insect burrows. Most species use drumming as a “song” (both sexes drum). Only the Wryneck is a long-distance migrant, others largely residents. From the family page, touch a specific species and it will open to the third-tier — the species account. The species account includes multiple illustrations of the bird in different plumages, general information on the bird, range maps, the species conservation status, and audio recordings. The illustrations are very good and the text is quite informative — the developers have taken all the text and illustrations from the body of the book and converted them to a digital format. To get the illustrations in full-screen, tap once. If you like, tap the screen again to remove the text and symbols. You can also pinch-to-zoom to enlarge the illustrations to see close-up details. One of my favourite app features is the comparison function. This was useful with so many new-to-me species to identify. There are two ways to compare species. The first is accessible on the right hand side above the species text. For example, below you can see the comparisons for Eurasian Nuthatch include Algerian Nuthatch, (Western) Rock Nuthatch, and Eastern Rock Nuthatch. The other comparison button is accessible at the bottom left of the app’s screen. Tapping on this allows you to create a customized side-by-side comparison of any species. You can do side-by-side comparisons of up to 12 species, but I found personally that two species is the best way to compare as the illustrations are still fairly large and the text is easy to read. A majority of species in the guide come with multiple audio recordings. Songbirds have songs and calls included, while less vocal species — such as waterfowl, shorebirds, and game birds — usually are accompanied by a single recording. There’s a search function that allows you to try to identify a species by selecting from a series of attributes including location and season, habitat, shape, size, plumage colour, family, bill colour, and more. 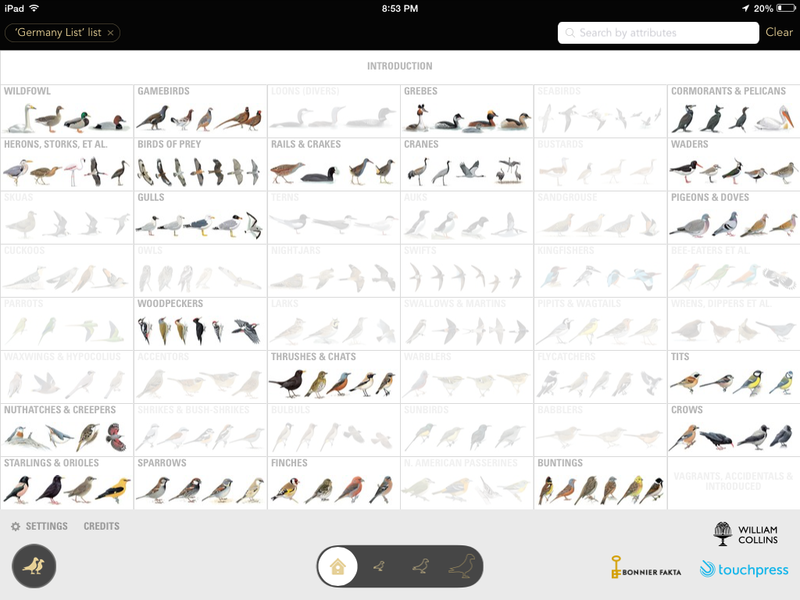 The app then provides a list of species that fit that criteria. The app includes the option to keep a life list and to create any others lists. The lists I kept/created were my Life List, Year List, France List, and Germany List. Tapping on the checkmark next to the species text will add that bird to your Life List (and there’s also an option to share your Lifer on social media). Then, tapping on the list icon next to the checkmark lets you add that species to any other lists you’ve created, or add a new list. To view your lists, go to the search bar where they’ll appear under “My Lists”. The lists are arranged in the three tiers, just like the rest of the app. One suggestion I have for any future app updates is for the app to total the number of species on each list and to let users add a date for when they see a particular bird. Play around with the app and you’ll quickly get the hang of the layout and flow. 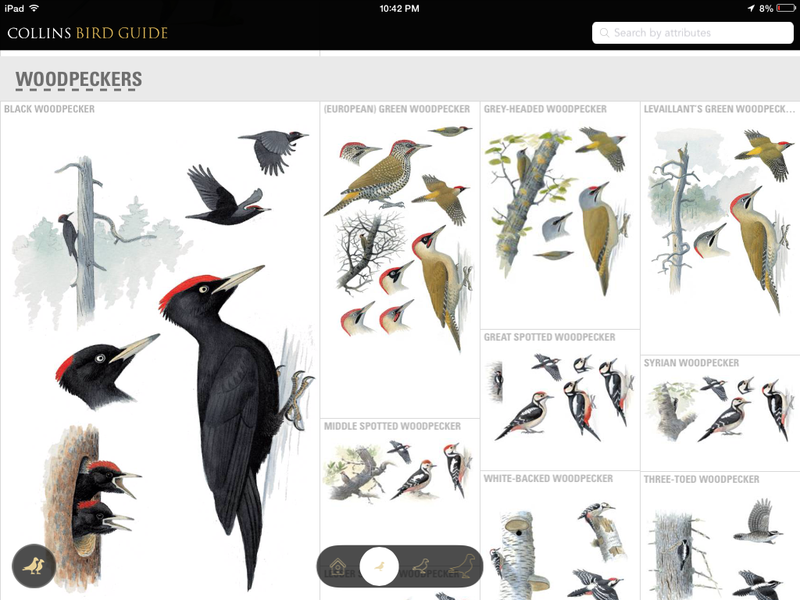 The Collins Bird Guide app is excellent with an easy-to-use interface and intuitive design — of the seven bird identification apps I’ve tried (The Sibley eGuide to the Birds of North America, Audubon Birds Pro, and Peterson Birds, to name a few), this one is easily the best, and it would be wonderful if there were a comparable app for North American Birds. 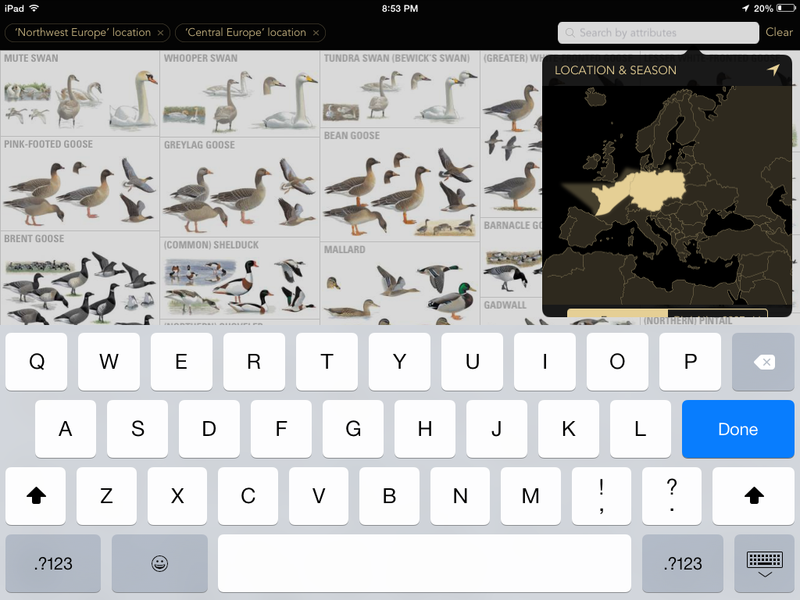 I highly recommend this app to any birders living in or travelling to Europe — it’s terrific! The app is compatible with the iPhone and iPad; and I’ve read that the developers are working on a version for Android. The app is $17.99 (US), $20.99 (CAN), or £13.49 on iTunes. Thank you very much to Touchpress for providing me with a review copy. 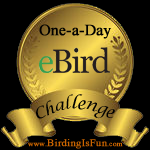 This entry was posted in Bird Identification, Birding, Birding Apps, Birding Trips, France Birds, General Birding, Review and tagged Bird Guides, Birding App Review, Birding Apps, Birding Identification App, Collins Bird Guide app, European Birding App, Review. Bookmark the permalink. Awesome review – Looks great, will keep it in mind if I brave apple products again. I sleep with the Collins guide on my bedside table so I know it’s good! Great review. I’m very, very tempted to download it now! Screen’s a bit smaller on the iPhone, but looks awesome. Thanks, Amy. Even though the screen will be smaller, give it a try. Liking it so far :) Will definitely come in handy in the field! Thanks for the review – will download it right away :-) I do have a good book but I’ll try the app. Let me know how you like the app, Natalie.